I never thought my mind could comprehend the idea of non orangey Jaffa cakes. Kind of like trying to imagine warm snow, or trousers made out of wood. But here we find ourselves in a post orange Jaffa cake world, and we are truly living in strange and dizzying times. Strawberry Jaffa Cakes have now landed exclusively at Tesco, and I for one know exactly what I will be getting for my afternoon tea break. Sorry but strawberry is definitely the new orange in my book. Costing a fairly priced 99p for a pack of ten biscuits/cakes, this won’t break this bank too much, and for those who are watching their waistline this weekend, they are just an itty bitty 46 calories each. 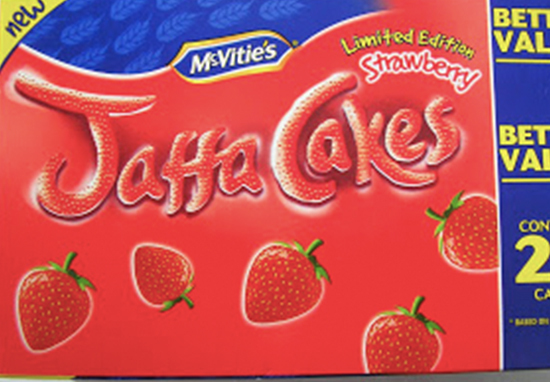 Omg strawberry Jaffa Cakes! Brought these last night from @tescofood 50p I love these!!!! These sweet treats – described by some shoppers as a ‘game changer’ – have caused a flurry of excitement in the biscuit/cake community, with plenty of Jaffa Heads rushing to Tesco to stock up. OMG I will inhale them. Those really look good! I love strawberry. However, some traditionalists were firm in their stance that the Jaffa shouldn’t be altered under any circumstances, moreish or otherwise. Nope – don’t mess with the Jaffa cake!! Once you delve a little into the world of alternative Jaffa Cake flavours, you realise what a sheltered life many of us have led. Other flavours have included lemon and lime, cherry and blackcurrant; all with the signature spongy base and chocolately coating. Seriously, where have these flavours been all my life and when can they all get in my mouth? Further research has revealed how the Jaffa doesn’t even have to be in solid form to maintain its identity, throwing that old biscuit versus cake debate into the wind. Good old Marks & Spencer have launched an indulgent Jaffa Cake cocktail for their Christmas 2018 season. The £10 bottle looks super festive and would make a nice change from your Boxing Day Baileys. Made from rum, this 350ml bottle should be shaken over ice and garnished with orange slices. I am getting serious Terry’s Chocolate Orange melting in your stocking vibes right about now and I am not complaining. These divisive yet delish strawbs are a limited edition speciality so get to Tesco quick sharp if you want to join in with the fruity fun.